This delightful quilt is written in six simple steps, made primarily of half square triangles using the Strip Tube ruler or Strip Tube Jr ruler. Kits will be available in Queen or King. We will meet the first Saturday of each month starting April 6th for six months. You will pick up your pattern and see a short demo on block completion. Our room will be open for anyone to sit and sew. We will offer a 20% discount on backing fabric purchased before Dec. 14, 2019. Happy Hour is for the little things! Join us at 5pm on the second Thursday of each month. If you have a suggestion for a project you'd like to work on in a one to two hour session, let Karen Izor know. Happy Hour is a free session and designed for support of sewing challenges and little fun projects. We will be making a throw size quilt for class. You pick your color and fabrics, we'll cut your kit. This is a great skill builder sampler quilt. We will meet the second Saturday of each month starting March 9th for 6 months. Two Creative Grid rulers required. 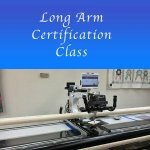 Learn to quilt your own quilts using the Long Arm Quilting Machine. QT Fabrics, the oldest textile mill in the US has gone digital. At this June Event in Blairsville GA, you'll learn all about Digital Printing of fabrics. See how digital fabric is printed. Learn why all digital fabric is not the same. Learn how to know quilt quality digital fabric. See the new design possibilities of digital printing. This fascinating event will be of interest and significance to crafters and quilters whose main tool is FABRIC, and is scheduled for June 27th Thursday 10:00 am in Blairsville, GA. Exact location to be determined. We'll continue to post updates in our blog newsletters, emails and social posts. 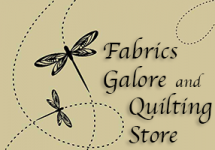 So watch for more info to come on this event made possible by Fabrics Galore & Quilting Store and QT Fabrics. Gather your Creative Grids Rulers and join us in making this beautiful sampler by Deb Heatherly.This will be a four part class, meeting once a month for four months. This quilt show is an annual event with door prizes, vendors, quilt raffle, exhibits, demos, certified quilt appraisals and so much more. If you're a part of the North Georgia quilting community, you don't want to miss this fun event. $6.00 admission, organized and hosted by Misty Mountain Quilters Guild - QUILTFEST.